Do you know what love looks like? Not romantic love or self- love, but the kind of selfless love we show to one another as human beings. One of the greatest traditions in the African-American community is taking care of and looking out for one other. Kids growing up on the block would be looked after by family, friends, neighbors, and strangers alike, because there was a feeling that we were in this together and we needed to protect and guide one another. It was like this in the 80s and 90s when I came up and certainly like this in generations prior. In contrast however, today it seems many people are "out for self" only taking care of themselves and their loved ones, with little to no focus on those beyond their immediate circle. Today there is an aversion to becoming involved in "other people's business" and a preference towards "minding your own". This is a mistake and one we as a community cannot afford to make. I subscribe wholeheartedly to the notion of "it takes a village to raise a child" and extrapolate that adage beyond raising children to taking care of one another as individuals in the same community. When did we lose this feeling of community and the sense of responsibility to be "my brother's/sister's keeper" and how do we get it back? Now don't get me wrong, there are pockets where this sense of community and extended family still exist and from where we can draw inspiration to return to a more open, caring, and community-oriented way of life. 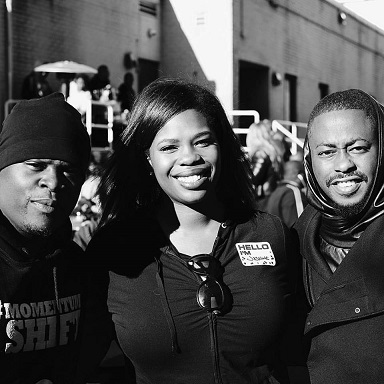 One bright spot is an initiative envisioned by Jasmine Crowe, Chief Change Maker of Black Celebrity Giving, entitled "Sunday Soul". 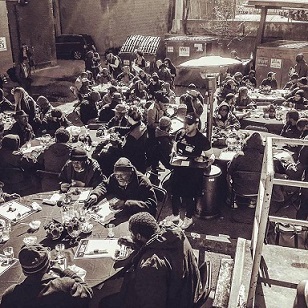 Sunday Soul is a program where people experiencing homelessness are provided a warm 5-course home-cooked buffet meal, offered free grooming and hair cutting services, while our favorite old school jams play in the background, family reunion style. The first Sunday Soul event took place in Atlanta in 2013, and most recently in Washington DC in March 2016. Upcoming events include one in Baltimore in May/June 2016 and another on the margins of the Essence Music Festival in New Orleans this coming July 2016. At the DC event, Dexter Fields, owner of the Millennium Barber Salon in Silver Springs, MD was 1 of 8 barbers from the Maryland based International Barbers Association (IBA) who provided over 187 grooming services and haircuts and where over 300 people were served. 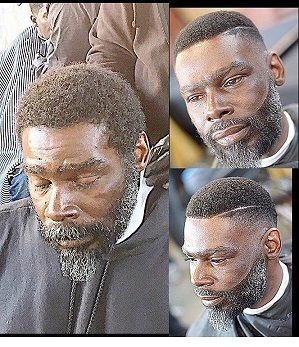 When I asked Dexter what motivated him to participate he said, "Barbers do this kind of thing all the time... barbers transform people every-day, people who missed a couple of haircuts, or for whatever reason are down on their luck and need that little boost to get them back on the right path. When I give someone a haircut, he feels good and empowered so when he goes to that next job interview, he is ready." When I asked Jasmine if the people who participate in Sunday Soul know about it in advance she said it is always a surprise because it is totally spontaneous. Sunday Soul was designed as a "pop-up" event where volunteers, chefs, barbers, DJs, and a hometown celebrity sponsor(s), (in the case of the DC event the celebrity sponsor was R & B singer Raheem DeVaughn), come together to provide a wonderful experience, which in addition to a good meal and haircuts, also include care packages, blankets and mental health counseling. Many who have participated in Sunday Soul said the experience made them feel like a whole person again. Dexter stated, "these men came to the shelter seeking a place to stay for the night and ended up with love being poured all over them". That's what this initiative is really about. It isn't about aesthetics or altruism for altruism's sake, but rather, respect, decency, preserving dignity, and taking care of your fellow man which has always been a center-piece of African-American cultural legacy. This is a beautiful thing which Dexter sums up nicely when he says, "when we collectively get together we are a force. The good in the world has to stand up and show that I am here so others will be empowered to join in. If I make a difference in one's person life, it is worth it." To me that is the definition of community. Thinking beyond yourself, doing your part, getting involved and giving to others knowing that when you are in need, it will come back to you ... that is the essence of love.